Make a joyful noise to YHVH, all the earth! Serve YHVH with gladness! Come into his presence with singing! Know that YHVH, he is God! It is he who made us, and we are his; we are his people, and the sheep of his pasture. For YHVH is good; his steadfast love endures forever, and his faithfulness to all generations. It’s time to feature another journaling page! 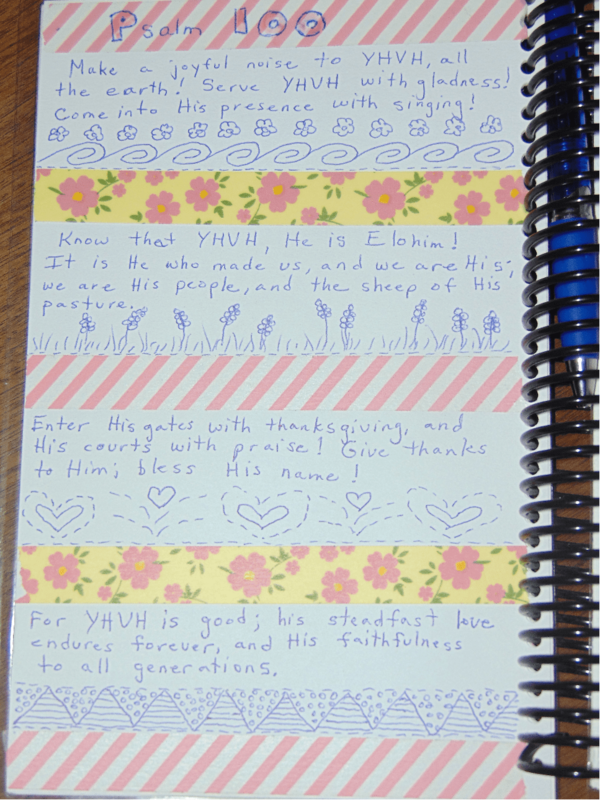 Have you started a Bible journal yet? Today’s page is Psalm 100. I love this Psalm. We can get so caught up with everyday life that we can forget to just stop and praise YHVH! 1 Take time for praise. Reading our Bible should have two goals. One is to learn what YHVH expects of us, and change ourselves to match. The other is to learn just how amazing our Elohim is and praise Him for it. I want to encourage you to spend time praising YHVH! Tell Him about His wonderful attributes. In Psalm 100, we see that He is good, faithful, and loving. He has claimed us as His own. Praise Him for that! 2 Take time for thanksgiving. I know we all have struggles. We have problems that we need help with. We need to seek YHVH’s face for wisdom. We need to be shown our own sin so that we can repent. But how often to we simply thank YHVH for all that is good? Make a list of all that is good in your life! It might just help you change your perspective on some things. I didn’t on this page, but you may want to use part of your page just to list what you are thankful for. It’s a good thing! 3 Doodle as you meditate. I enjoyed doodling as I thought about this Psalm. Feel free to decorate a bit as you read and write Scripture. We should leave the world a little more beautiful than the way we found it. 😉 It’s also a great excuse for taking more time for Bible reading. “I still have to finish my page!” I want you to look forward to your time in Scripture, and for me, making my page pretty helps. The tape I used to divide the verses is washi tape. If you haven’t heard of it, check it out. It’s so fun! Just the exercise of writing the verses out is very beneficial. You can read more about that here. Have you started a Bible journal yet? Tell us about it in the comments, and join us next Monday for another page and more ideas. Encourage your children to write Scripture, too! Bible Science Copywork can be a great tool.